Rack and Shelf Labels stock a wide range of label holders ready for immediate dispatch. Our customers use them when storing products of varying sizes and quantities on shelving and racking alike. We provide various fixing types including self adhesive, plastic, magnetic and clipped options. We have carefully selected label holders from designs that are durable, easy to apply and convenient to use. Customers often return with repeat orders which we can replicate exactly and have provided multi-site installations for customers who prefer others to fit them. Rack and Shelf Labels carry an extensive stock of label holders so customers can order online and receive their goods in a timely manner. 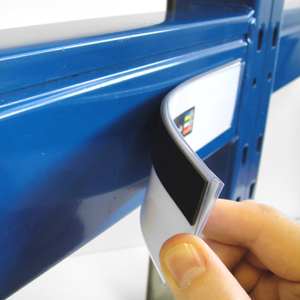 The range includes self adhesive, plastic, magnetic and clipped label holders which we find cover most needs. Specialist designs and specifications have increase lead times but we assure all customers of a prompt service. If you need help to find the right product please feel free to call us today and discuss your label holders and/or application. We know it's not always straight forward and will help with suggestions, samples and practical advice where possible. As with all of Rack and Shelf Labels product range, a fully managed installation service to match the performance of the label holders is available throughout the UK.